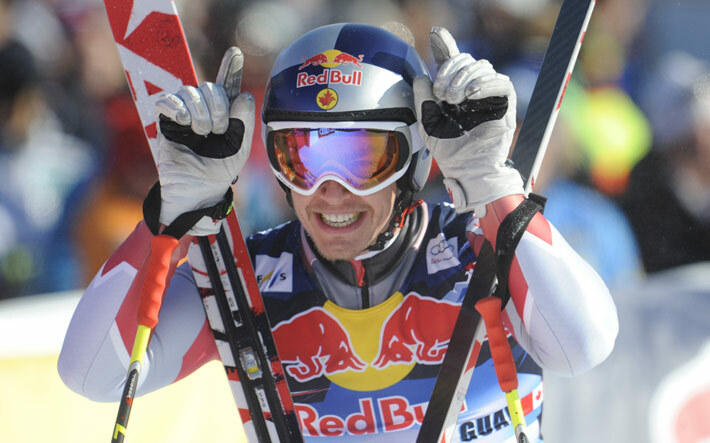 With his first podium at the spectacular Kitzbuhël World Cup Downhill in Austria Saturday, January 26., Erik Guay, holder of the downhill world champion title in 2012, took a crucial step in his career. It was the only recognition, besides an Olympic medal, that Erik needed to become one of the world’s greatest skiers in the history of alpine skiing. He is also one World Cup medal away from reaching the Canadian world cup medal record of 20 held by Crazy Canuck Steve Podborski, who raced with the national team in the 80s. Local supporters are filled with pride and excitement as that historic silver medal is the main subject of discussion this week: “We are very proud that a skier from Tremblant makes a podium in this legendary race. It’s an honour for us to have him represent our beautiful mountain and we wish him good luck on February 9 as he will be defending his Downhill World Champion title in Schladming. We look forward to his return home to congratulate him in person”, said Patrice Malo, President and Chief Operating Officer at Station Mont Tremblant. Tremblant employees and friends will stay tuned on the news on Wednesday for the Super G and Saturday in the early morning hours as Erik attacks the course in Austria to defend his Downhill World Champion title. Photo credit : Pentaphoto alpine canada.